It is a little-known fact that Toronto served as the origin point of the most explosive outbreak of a horse disease ever recorded. York history Professor Sean Kheraj has published new research on this extraordinary and unknown history. “The Great Epizootic of 1872-73: Networks of Animal Disease in North American Urban Environments,” published in the July 2018 issue of Environmental History, reveals that Toronto’s horse population was ground zero for an equine panzootic that caused a devastating disease to spread rapidly across North America. 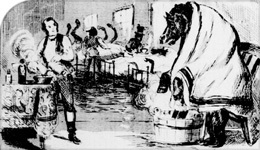 Almost 150 years ago, nearly all of the urban horses in Canada and the United States were infected with this mysterious illness. Kheraj’s research geographically tracks the disease’s spread over a 50-week period as it radiated outward from its origin in Toronto to infect horses in all major North American cities, from Montreal to New York City to Chicago to San Francisco. “Although the disease was rarely fatal, it incapacitated horses for weeks, bringing street traffic and business to a halt,” said Kheraj, who teaches in the Faculty of Liberal Arts & Professional Studies. His research reveals the extent to which 19th-century urban dwellers were utterly dependent upon horse labour for transportation and commerce in an era before the automobile and electric streetcar. Subsequent rapid outbreaks of animal and human disease that took place later in the 20th century include the Spanish Influenza of 1919 and even the global outbreak of SARS about 15 years ago. Kheraj will discuss the Great Epizootic further during walking tours he will lead about the history of animals in the city for Heritage Toronto on June 3 and Sept. 15. For more information, visit heritagetoronto.org/programs/tours.